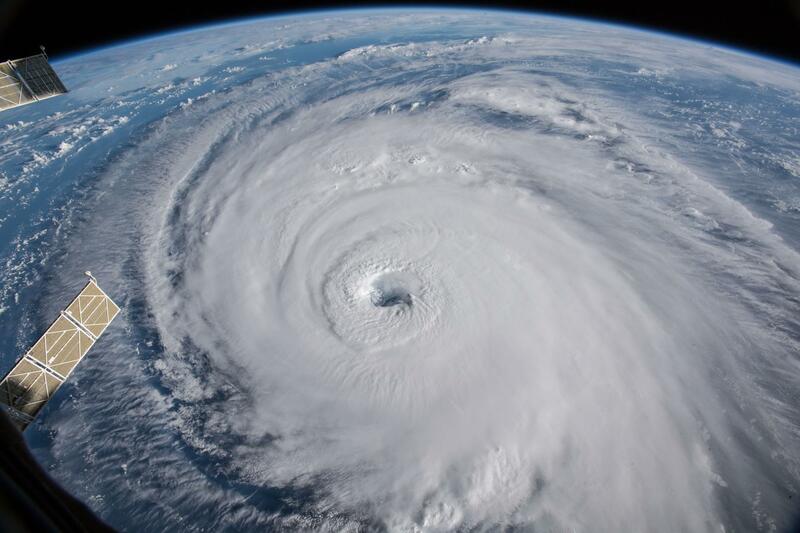 Cameras outside the International Space Station captured this view of Hurricane Florence on the morning of Sept. 12, before it made landfall on Sept. 14. I’m the community relations director for Richland Library (richlandlibrary.com), which is situated in the heart of South Carolina’s capital city, Columbia. Our library system has 12—soon to be 13—bustling facilities and welcomes more than 2 million visitors yearly. We are a midsize library system with a large community impact. In September 2018, a massive hurricane, Florence, was headed our way. As residents flocked to grocery stores to stock up on supplies, our library staffers were taking stock of our crisis preparedness. Were we ready for the dangerous Category 4 storm? What should we tell our customers? When do we make the decision to close our doors? With the storm barreling toward us, we knew it was time to enact our newly created crisis communication plan. For more than 9 months, my office had been working with staff members to craft a plan that addresses how to handle a number of potential crises, and now, we had an opportunity to test our proverbial mettle. Days before the storm was expected to make landfall, governor Henry McMaster evacuated the coastal counties and closed schools in districts statewide. With the state’s disaster plan engaged, library managers and executives sat around a table and worked our own plan. Everyone had a clear understanding of their roles and responsibilities. As we put our plan in motion, we were grateful we had done the work to strategically map out how to weather the storm (pun intended). We were ready. When dealing with a crisis, that’s an empowering statement: “We were ready.” These three words can make the difference between a successful outcome or a negative public blowup or fallout. In his book What Were They Thinking? Crisis Communication: The Good, the Bad, and the Totally Clueless, communication guru Steve Adubato aptly states that “a crisis can happen anytime, anywhere, and to anyone … and a crisis is made worse by the lack of preparation and by the poor execution of a response. …” This statement rings true. In my nearly 20 years of experience in broadcast news and public relations, one thing has remained an unequivocal fact: It’s not a matter of if, but rather when, an organization will deal with a crisis. From my experience in developing a successful crisis communication plan, here are my four rules to help handle any emergency. This is not only a valuable life lesson, it’s also an essential rule in crisis communication. Being prepared is at least 75% of any successful plan. If you begin thinking today about tomorrow’s crisis, you set yourself up for a positive result. A crisis communication team—One of the most important elements of our plan is our identified crisis communication team. When something happens, the team is activated, and a single communication chain is created. While I know that every library is different and has different positions and departments, our team includes the following: the executive director, chief operation officer, and chief customer officer, as well as managers of safety and security, building operations, technology, marketing and digital services, internal communications, community relations, and location. Templates—We created templates and samples of press releases, media alerts, staff communication, and phone messages. Having formulated templates and scripted messages shortens our response time. Talking points and FAQs—There are a number of predictable questions that will be going through people’s minds when a crisis unfolds, so we crafted talking points for staffers to help address any concerns or questions that arise. Prewritten text—Again, by having prewritten social media posts and copy for our digital signs and website, our crisis team can respond quickly and efficiently. A list of roles and responsibilities—Having a checklist that outlines each crisis team member’s role and responsibility helps keep track of incoming information and who should be doing what, when. A crisis can unfold quickly and have many moving parts—both externally and internally—and we must be ready to work with staff members, library supporters, customers, elected officials, and, of course, the media. With a solid plan in place, we can avoid mistakes that may live on long after an emergency is over. By staying ready, we don’t have to scramble to get ready when the unexpected happens. Rule 2—Create a Stray-Free Zone: You’ve seen it time and time again: The camera is pointed at someone. The reporter is armed with questions, and the minute the red light turns on, the interviewees’ brains shut down. They ramble. They scramble. They fumble. Of course, it’s easy to blame the appointed—or often, self-appointed—spokesperson’s lack of preparation. We can judge him or her from the comfortable perch of hindsight. But the truth is, this could easily be any one of us in a time of crisis. Talking too much is a natural human response. In fact, in an article titled “The Science of Why We Talk Too Much (And How to Shut Up)” (bit.ly/2PGWQzW), author Lydia Dishman explains, “Science says that humans, being social animals, are programmed to use communication as a vital tool to survive and thrive.” So when you are in the throes of a crisis and in survival mode, it can trigger you to talk too much. To help curb this natural response, it’s important to have what I call “your top three” prepped and ready to go. Having your top three talking points at the forefront of your mind helps quell your tendency to ramble or scramble. In television news, there is a saying, “The more you say, the better chance you will stray.” By staying on track and sticking to your talking points, you lessen the opportunity to divulge too much or to say something that will reflect badly on you or your library. crisis: “The safety and welfare of our staff and customers are our first concerns.” and “Please contact our community relations department or the responding agency for additional information.” Richland Library employees can use these prepared responses interchangeably or in part, based on the situation. They communicate a clear message and ensure that staffers are not caught off guard. To get our employees on board and trained on how to respond to a crisis, we conduct media and crisis communication training annually for all staff members. It is imperative that people from other departments and all of our locations are trained and prepared. By empowering them with the correct message and providing them with the tools they need to respond in various situations, we’ve created a stray-free zone. Rule 3—Tell the Truth: This rule may be the hardest. When a crisis occurs and your organization or library is to blame or has the potential to be seen in an unfavorable light, sometimes it can seem problematic to tell the whole truth. But in reality, it can be more detrimental to your organization to tell a half-truth or a lie in the midst of a challenging situation. In today’s media-savvy ecosystem, the truth will always find its way to the surface. By facing a crisis using transparency and honesty from the beginning, you eliminate the chance of a scandal erupting by being caught in a lie from the original crisis. [A] fatal overdose in February at a San Francisco library branch pushed officials there to forge ahead with Narcan training for security officers, social workers and employees who help the homeless, said Michelle Jeffers, a library spokeswoman. ‘We want our libraries to be safe for all visitors,’ she said. These are dangerous waters that librarians are having to navigate. It may have been easier for them to shy away from answering questions about the opioid crisis. Instead, Jeffers and others chose (rightly) to approach the issue head-on. By exposing the challenges public libraries are dealing with, they turned what could have been a negative story about librarians into a story about heroes who are willing to go above and beyond the call of duty for the customers they serve. 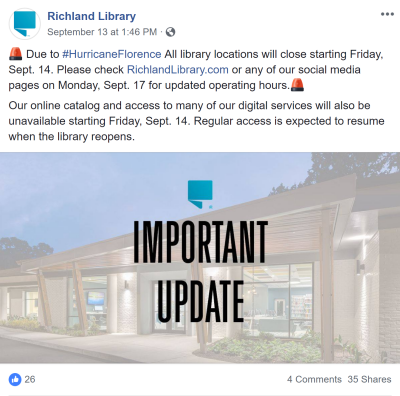 When a car crashed into one of its buildings, Richland Library’s community relations department knew it was time to craft a formal crisis communication plan. 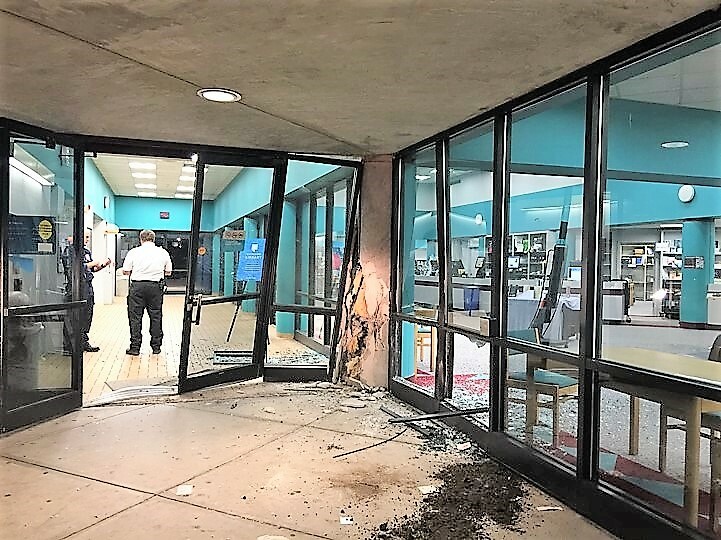 In February 2017, an elderly customer, while trying to put her car in reverse, accidentally crashed into one of our library buildings, causing significant damage and sending three people to the hospital. The accident happened during peak time at the library, and in a matter moments, staff members had to evacuate the building and handle the evolving crisis. While in the moment, our office dealt with it as efficiently as possible, but there were a few missteps. There were some notification delays. Not everyone was on the same communication chain, so there were multiple conversations happening via text, email, and phone. It was difficult to keep up. We ended up in a position in which we were following the breaking news and not leading our response. This emergency exposed our vulnerabilities and our need to create a plan that was inclusive and responsive. The day after the accident, we started working on creating a systemwide crisis communication plan to streamline our communication channels. We needed to be sure that when the next crisis happened, we were prepared. We reviewed our communication of the accident and studied our response from every angle. We wanted to learn as much as we could from this experience, so we wouldn’t have to relive our missteps again. 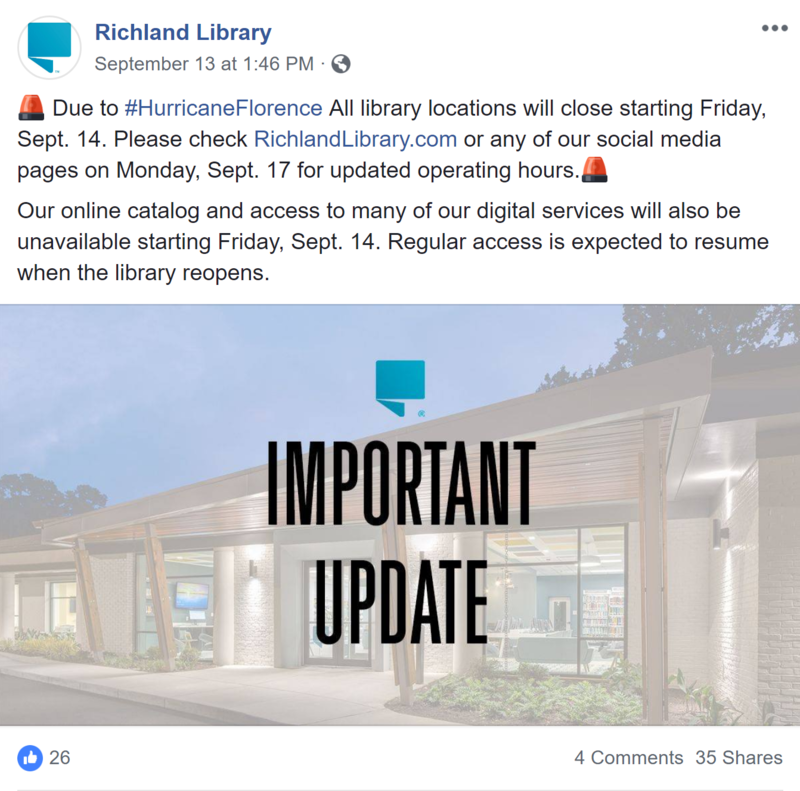 Unlike other areas of our state, our county and library received little damage from Hurricane Florence in September. We are thankful we were spared, and while the storm left little physical impact, it did give us an opportunity to test our crisis communication plan. We canceled programs in advance of the storm. We had a streamlined notification system when we decided to close: We told employees first, then customers and stakeholders, and finally the media. Internal communication told staffers we would be closing early to allow them to prepare for the impending storm. We used our digital signage to help communicate our news. Our templates and drafted messages made it easy to communicate our plans during a very unpredictable storm. When the hurricane had blown over, we again sat around the table to debrief. In this circumstance, we agreed that our crisis response had a positive result. The majority of our staffers found our internal communications helpful. We considered our customers and their safety when eventually deciding to close for 3 days, and we used various media platforms to update the community. We had a successful outcome, but we shouldn’t and won’t rest on our laurels. In the world of emergency preparedness, you can always do better. Whether handling a scandal or escaping a scrape, you’re only as good as your last response. So we’ll stay ready. Tamara King is the community relations director at Richland Library in Columbia, S.C. She holds an M.L.I.S. and a bachelor’s in journalism and mass communication, both from the University of South Carolina in Columbia. King is an award-winning public relations professional with nearly 2 decades of experience in broadcast television, public relations, marketing, strategic communications, media and crisis communication training, and program management. Her email address is tking@richlandlibrary.com.